Provide comfort for the family of Herbert Roehl with a meaningful gesture of sympathy. Our beloved brother, husband, father, uncle, grandfather, great-grandfather and friend Herb is now joyfully walking again with his darling Della and worshiping God in heaven. He was 93 years young when promoted to Glory. Herb was born in Mott, North Dakota, the second of 13 born to Sam and Lydia Roehl. By age nine the family was working a large farmstead in New Leipzig, North Dakota, where he lived and grew into adulthood. He met Della Rieger in high school and was immediately smitten, but too shy to even hint about his feelings for her. Although given a farm deference, Herb wanted to serve his country and at age 20 enlisted in the Army, going to Korea in 1945. After his time in the service, he joined other family members that had moved to Missoula and began re-entering civilian life. Much to his delight one of his sisters had maintained a friendship with Della, and he had a second occasion to win her heart when she came to Missoula for a visit. This time he didn’t squander the opportunity. They were married in 1948. His career consisted primarily of being a Missoula Police Officer (1953-1973), school bus and tour bus driver for Beach Transportation (1974-2002), and lastly as a driver trainer and evaluator for Beach Transportation (2004-2013). Herb will be remembered by all who knew him for two prominent traits: He deeply loved Jesus, and he loved people. He was a man that reached out and engaged. He made each of us feel as if we were the most important person in the room. For more than 20 years, each Sunday after church he would sit near the clock in the mall and visit with family and friends that happened by. There were so many conversations to have, and never enough time. Herb was preceded in death by his beloved Della, one grandson (Dallas), two brothers (Raymond Randall; died in infancy, and Charles), and one sister (Lillian). 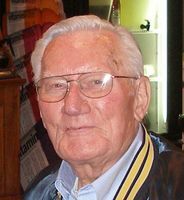 He is survived by his son Steven (Denyse) Roehl and daughter Deborah Blackmon; five grandchildren, eight great-grandchildren and nine siblings: Adeline, Raymond Truman, Dorothy, Pauline, Mary, Ruby, Viola, Luella and Irene. Private internment to take place at Sunset Memorial Gardens. A celebration of life will be held March 22, 11 a.m. at Christian Life Center (3801 South Russell). Memorial contributions may be made to the Seniors Group at Christian Life Center. To send flowers in memory of Herbert Harry Roehl, please visit our Heartfelt Sympathies Store. We encourage you to share your most beloved memories of Herbert here, so that the family and other loved ones can always see it. You can upload cherished photographs, or share your favorite stories, and can even comment on those shared by others.